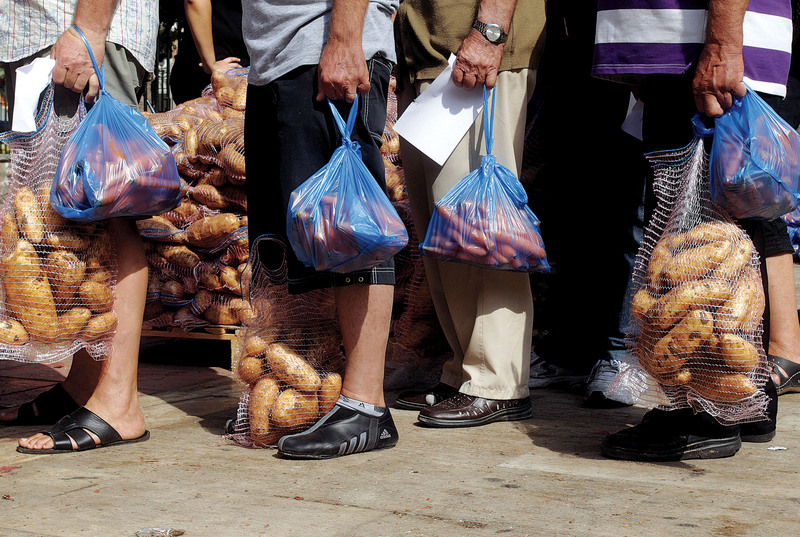 Hunger stalks southern Europe: A nationalist political party distributes food in Athens, September 14, 2012. 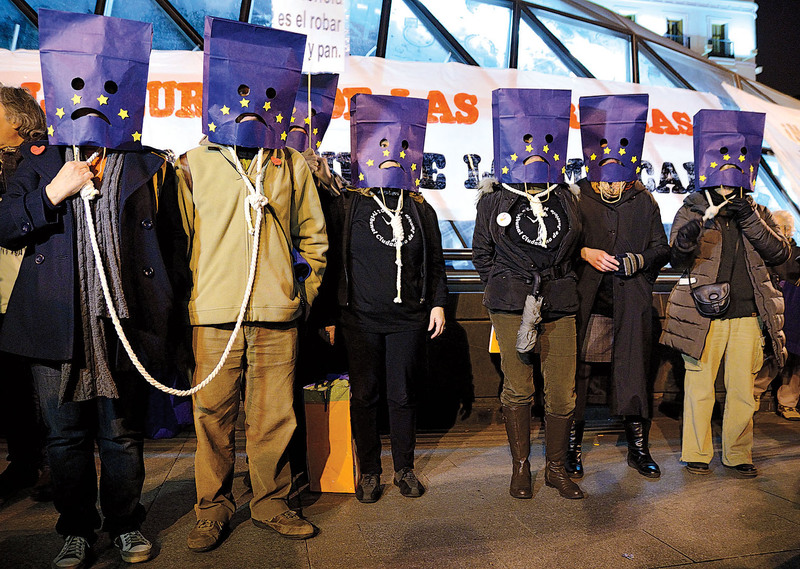 Political passions: Madrid protesters against austerity wear nooses and bag their heads with a European Union flag motif, March 16, 2013. “Ten years into its existence, the Euro is a resounding success. The single currency has become a symbol of Europe, considered by Euro-area citizens to be among the most positive results of European integration….” Barely five years after the European Commission issued this 2008 celebration of its new currency, the statement seems highly ironic. Europe is locked in a struggle for the survival of the euro—and indeed, for the prosperity of the continent and its people. German chancellor Angela Merkel does not exaggerate when she says that “the euro crisis is the greatest test Europe has faced since the signing of the Treaty of Rome in 1957”—the foundation of the European Economic Community (EEC). Across southern Europe, millions of families are living in misery, as rates of unemployment exceed 25 percent in Greece and Spain and approach 15 percent in Portugal (and, on the western periphery, in Ireland), while the salaries of teachers, nurses, and other public employees are slashed, and firms go bankrupt in unprecedented numbers. The suicide rate in Greece has doubled during the past three years. This economic stagnation is now depressing performance even in Germany, normally the engine of the European economy; gross domestic product (GDP) in the 17 Eurozone countries is forecast to contract this year. How did the Europeans get into this mess—and how are they going to get out of it? There are no obvious answers—indeed, the regional variation in the answers usually given across Europe is telling. But deeper analysis can be illuminating, not only about the euro crisis itself, but about that unique political construction that is the European Union (EU). Reading about the euro in the financial press is like watching Rashomon, that marvelous Japanese film about memory and forgetting. Many who once applauded the monetary union now condemn it. Today, everyone agrees that the institutional structure of economic and monetary union (EMU) is inadequate. Why then did the Europeans agree to it in the Maastricht Treaty of 1992? Monetary union was adopted as much for political reasons as for economic ones. The EU members were dissatisfied with the previous system that fixed their exchange rates within narrow bands—a system that provided monetary stability but required painful negotiations when current-account imbalances arose between the member states; moreover, some governments resented the dominant role played by the German Bundesbank in this process. Ironically (in retrospect), the move to EMU was in some respects an effort to escape this need for transnational negotiations about economic policy. There were also economic payoffs. Germany was to gain secure markets in neighboring countries that would no longer be able to devalue their currencies to increase the competitiveness of their goods vis-à-vis German ones, while the French imagined that the new European central bank would be more sensitive to their interests than the Bundesbank. But EMU was also conceived against the backdrop of German reunification after the fall of the Berlin Wall in November 1989. There was never a strict quid pro quo, but the single currency was sold in France and Germany on the understanding that it would bind a newly powerful Germany to Europe. It matters for events today that EMU was ultimately a political construction, seen then as the crowning achievement of European integration. But the institutional design of EMU was highly technocratic. Authority over monetary policy was vested in a new European central bank (ECB) entirely independent of political control. Fiscal policy was to be guided by the minimalist rules of a Stability and Growth Pact that limited national deficits to 3 percent and national debt to 60 percent of GDP. There was no institutional provision for medium-term coordination of fiscal policy among countries, and the ECB was forbidden to issue debt to subsidize national governments—a capacity most national central banks have. Behind this design we can see the influence of the economic doctrines of the early 1990s. By then, the Keynesian view that growth depends on active governmental macroeconomic management had been discredited by the stagflation of the 1970s. A new “rational-expectations” economic orthodoxy specified that monetary policy has few effects on the real economy and fiscal policy is generally ineffective. Thus, monetary policy should be rule-based and targeted only on inflation, while growth was said to depend, not on the management of demand, but on structural reforms to the supply side of the economy—based on changes to regulations and tax rates designed to increase competition in markets for goods and labor. “Rules rule” ran the graffiti in the City of London at the time, and that is what EMU provided. What went wrong? The conventional answer, popular in northern Europe, is that the southern Europeans and Irish broke the fiscal rules of EMU. There is some truth to this. The crisis was sparked in December 2009 by a new Greek government’s revelation that its budget deficit was more than twice as large as previously reported. Because Greek national debt was already at 113 percent of GDP, these new figures sparked a crisis of confidence in the international bond markets that soon spread beyond Greece, raising the cost of borrowing for the Irish, Spanish, Portuguese, and Italian governments (the other Eurozone members perceived to have weak economies or national balance sheets). After torturous negotiations, the member states of the European Union (EU) and the International Monetary Fund (IMF) offered long-term loans to bail out the Greek, Irish, and Portuguese governments, while the ECB pumped funds into their banking systems to assure their liquidity. Moreover, much of the lending that fueled the crisis had gone not to spendthrift governments, but rather to the private sector. The euro crisis is really Europe’s version of the global debt crisis (as the collapse of the housing market was in the United States). There was plenty of “irrational exuberance” to go around. During the past decade, for instance, Spain built more houses than Germany, France, and the United Kingdom combined, and the Irish banks so inflated their balance sheets that rescuing them in 2010 briefly swelled the Irish budget deficit to 32 percent of GDP. In such instances, the lenders as well as the borrowers are to blame. With the advent of the single currency, international financiers treated all the member states as safe markets and flooded them with cheap money. Was it entirely unwise for firms and governments to take advantage of those funds to fuel their growth? Perhaps—but as we know in this country, they were not alone. Among those most eager to lend to the periphery were the financial institutions of northern Europe, which by the end of 2009 held more than €2 trillion in Irish and southern European debt. Thus, the crisis of confidence that occurred in 2010 was really a crisis for the European financial system as a whole. When they bailed out Greece, Portugal, and Ireland, the northern Europeans were also bailing out their own banks—although it was more politically expedient to blame the problems on southern governments. Those seeking deeper causes for the crisis often fasten on the rising imbalances in payments across Europe, as Germany built up large current account surpluses and the peripheral member states deficits. The southern Europeans were buying more from northern Europe than they sold there, and financing those purchases with loans from the north. Behind these imbalances was a growing gap in unit labor costs, a conventional measure of national competitiveness, as wages in southern Europe rose faster than those in much of the north. On this basis, many claim that southern Europeans used the first decade of the euro to live beyond their means without taking enough steps to keep their economies competitive. Taken literally, this is incontrovertible, but the reality is more complicated. What governments and firms can do is conditioned by the organization of the political economy. That is based on institutions that develop over long periods of time and cannot be changed overnight. The EMU joined together several different varieties of capitalism, each of which pursues economic growth in a different way. To simplify slightly, we can distinguish between northern and southern European economic models. Germany’s coordinated market economy exemplifies the northern model. That nation can hold down labor costs because its industrial-relations institutions encourage firms and unions to coordinate on modest wage increases. Its highly collaborative vocational training system, operated by strong employer associations and trade unions, provides firms with skilled labor that gives them comparative advantages in producing high-value-added goods and capacities for continuous innovation—enabling German enterprises to compete globally on quality as well as price. An economy organized in this way is ideally suited to mount the kind of export-led growth strategies that lead to success inside a monetary union. By contrast, Spain, Portugal, Greece, and Italy entered EMU with political economies not well-suited to this type of growth strategy. They have fractious labor movements divided into competing confederations, and weak employer associations. As a result, they lack the capacities for collaborative skill formation and wage coordination central to northern European economic strategies. Instead, their governments have tended to rely on demand-led growth, in which governments increase spending to encourage domestic consumption and then use periodic depreciations of the exchange rate to offset the inflationary effects of this strategy on the competitiveness of their products. Depreciation lowers the price of a country’s exports in foreign markets and raises the price of imports that compete with domestically produced goods. For these countries, entry into monetary union offered as many handicaps as advantages. By expanding education and initiating structural reforms to make labor and product markets more flexible, they could improve the competitiveness of their firms—and to varying degrees, all southern European governments undertook some such reforms. But in the face of strong producer groups defending vested interests, these reform processes are bound to be protracted. In the meantime, unable to operate export-led growth strategies, these countries continued to pursue growth led by domestic demand—but in a context where they could no longer offset its inflationary effects on the competitiveness of their products: they could no longer devalue their national currencies. The result was ballooning current-account deficits. At the root of the euro crisis, therefore, is an institutional asymmetry built into EMU from its inception. The northern Europeans entered monetary union with institutional frameworks well-suited to the export-led growth strategies that yield success in such contexts, whereas the southern Europeans entered with ill-suited frameworks—and lost the capacity to devalue on which some had relied. These issues escaped notice when EMU was designed (because it was widely assumed that the member economies would converge on a single set of best practices), and they are still ignored by those who think that the solution to the current crisis is for the southern European economies simply to become just like those in the north. Is There a Euro Future? So where does this leave the euro today? Can it survive continuing pressure in the international bond markets? What does the response to the crisis tell us about the European Union itself? The problems are certainly daunting, because the euro crisis is actually three crises in one: a crisis of confidence in the bond markets, a debt crisis in the European financial system, and a growth crisis for the continent as a whole. • The crisis of confidence is reflected in the reluctance of international investors to purchase sovereign debt in parts of Europe, raising the cost of borrowing for some countries and firms to unsustainable levels. Although confidence could fall again at any moment, this crisis is abating. The ECB’s announcement last September that it was prepared to purchase unlimited amounts of sovereign debt from countries that met conditions imposed by the European Stability Mechanism (the Euro-area bailout fund) had a calming effect on the markets. With this step, Mario Draghi, the Italian president of the bank, was deftly skirting the rules of EMU to offer something close to a guarantee for these countries’ bonds. • The underlying debt crisis, however, remains unresolved. A debt crisis arises when existing levels of debt are too high to be fully repaid. The key to resolving it is determining who will pay what—and who will not get paid. Economists often argue that such steps will be less painful if taken quickly. Aside from some restructuring of sovereign debt in Greece, and of bank debt in Spain and Ireland, however, the member states of the European Union have largely put off such decisions. At the outset of the crisis, this posture may have saved their financial system from even bigger problems, but the day of reckoning cannot be postponed forever. The ground has been laid for a resolution of this problem through a series of steps that put much of the questionable debt into the hands of national governments, the ECB, and European rescue funds. This suggests that some of the debt may be forgiven, with the public sector footing the bill. But negotiations about which governments will pay, and whether the ECB will pay as well, are bound to be painful. Not much will likely get done until after the German elections this fall, but governments will then be seeking solutions that obscure the precise distribution of costs and benefits, as they did in February when Ireland’s promissory notes were replaced by long-term bonds. From an electoral perspective, obscuring those costs is important because the initial response to the crisis by the northern European governments has made their long-term task more difficult. Instead of presenting the crisis as an existential dilemma for Europe, northern politicians reacted as if it were entirely attributable to the fiscal fecklessness of southern European governments. The media soon translated that into crude stereotypes about “lazy Greeks” that have evoked similar images in the south of “jackbooted Germans,” thereby eroding the pan-European solidarity the EU worked for so long to cultivate. The resulting ill will has made the problem of mobilizing political consent for any adjustment strategy more difficult. • Unfortunately, there is no solution in sight for the growth crisis afflicting Europe. Its effects have been worst on the periphery. During the past five years, GDP has fallen by more than 20 percent in Greece and nearly 7 percent in Spain, Ireland, and Italy. Because 40 percent of German exports, and 60 percent of French ones, go to the Eurozone, continental growth is now depressed as well, and the ECB forecasts that GDP will grow by only 1 percent in the Eurozone next year. In response, the European Union claims it has a growth strategy based on two pillars: a fiscal compact that will commit most of the member states to balanced budgets, and a program of structural reform that will intensify competition in markets for products and labor. But neither step is of any real value in the short term. As the IMF recently confirmed, fiscal austerity is making the problems of the south worse: in some countries, budgetary cutbacks designed to reduce the share of the public deficit in GDP are depressing output so much that the debt share is in fact increasing. And even though structural reform can make some economies more efficient in the long term, the hope that it will regenerate growth in the near to medium term is a mirage. Sophisticated European policymakers know this, but because they have to have a growth strategy, in the absence of any agreement on an alternative, they keep repeating this mantra. Is there an alternative? In the immediate future, coordinated fiscal reflation, which would see austerity relaxed in the south and government spending increase in the north, would help. But because that could entail fiscal transfers from north to south, it is hard to sell to electorates, and northern governments fear that if they loosen their fiscal demands on the south, the reform process there will stop. Only when electorates across Europe realize that they are all in the same boat will they take turns rowing together. But the question is whether they will realize that before experiencing the kind of prolonged stagnation seen in Japan during the 1990s. The longer-term issues in the south are even more intractable. Most of the northern European countries have viable growth models, and Ireland can likely grow again as a low-tax site for multinationals in Europe. But it is unclear whether Spain, Portugal, and Greece can continue to prosper inside the single currency. They do not yet have a strong institutional base for high-value-added production, and their low-wage sectors face stiff competition from the world’s emerging economies. Monetary union is making it hard for them to pursue demand-led growth. But it would be premature to predict the monetary union will break up. For Europeans, the single currency is not simply a convenient economic arrangement. It is the symbol of an integrated Europe to which many are committed—and the EU has a history of making novel political arrangements work. This is a fundamental point often missed in dry economic analyses of the institutional requisites for monetary union. Where there is a will, the political elites of Europe have often found a way, even when it entails protracted negotiations and unwieldy compromises. The big question, therefore, is whether that will can be sustained and given effective political expression in the face of a debilitating austerity that has left southern electorates disillusioned and confused. Only with difficulty did Italy cobble together a coalition government after an election in which the third-most-popular party was led by a comedian incensed at political corruption, and the third-most-popular party in Greece is an anti-immigrant movement given to fascist tactics. It is not surprising that southern Europeans are fed up with their leaders. Many want monetary union without austerity. But that is not currently on offer from their northern neighbors or the bond markets. Even with more help from the north, it is not clear that the political systems of the south will continue to yield governments willing to take the measures that would make monetary union sustainable. Since monetary union has always been a political construction, perhaps it is fitting that its fate now turns on the political capacities of Europeans to reconstruct it. Unless national governments can mobilize electoral majorities in favor of burden-sharing, the prospects for EMU do not look auspicious. Watching them try has been a sobering and at times ugly spectacle. But, even on this side of the Atlantic, we know that democratic politics is an inefficient process, and Europe has a postwar record of reinventing itself that suggests the task is not impossible. Peter A. Hall is Krupp Foundation professor of European studies and co-director of the Successful Societies Program of the Canadian Institute for Advanced Research. His most recent book, edited with Michèle Lamont, Goldman professor of European studies and professor of sociology and African and African American studies, is Social Resilience in the Neoliberal Era (Cambridge University Press).